Want an Driving Instructor who will give you a great chance of passing 1st time? 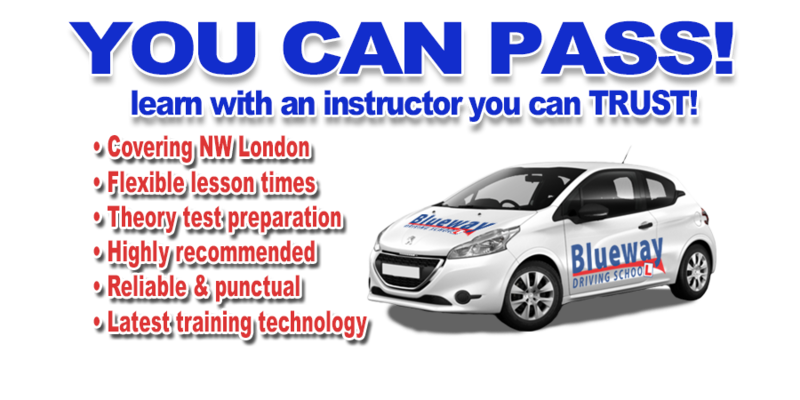 Whether you are a complete novice getting behind the steering wheel for the very first time, or a more experienced learner who has already had a number of lessons or even have a full licence but want to top up on your skills and confidence, Blueway Driving School could be who you´re looking for. We provide a high quality of good training with lessons tailored to suit the individual pupil so you can be taught at the best pace to suit you. We teach with a calm and patient manner which puts even the most nervous pupils at ease very quickly. We only use fully qualified driving instructors, we have been serving west and North London over last 12 years and counting with high pass rates. Pass Plus Driving Courses, Refresher Driving Lessons, Motorway Driving Lessons, Night Driving Lessons, Intensive Driving Courses, Intensive Driving Lessons with reliable friendly and recommended driving instructors. Manual and Automatic Smart Motorway Driving Courses, Driving School in North West London, Drive Confident Driving Lessons With Honest and Reliable Driving Instructors.